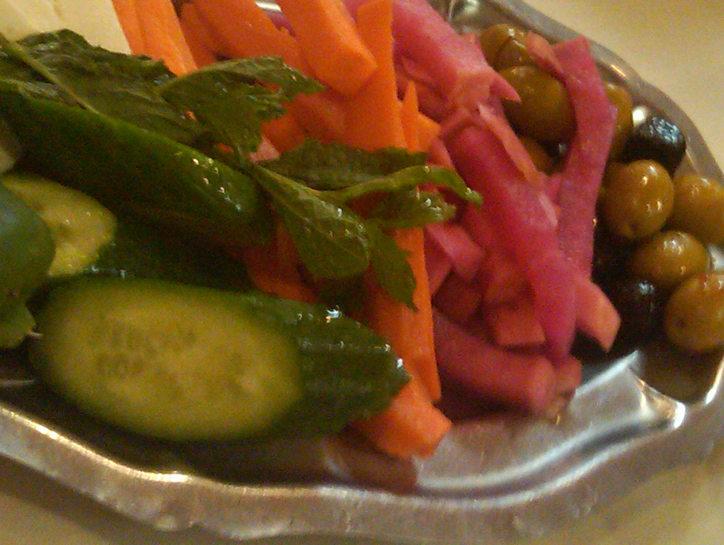 It's not exactly news that I'm a fan of pickled vegetables. I'm also a salt addict. Duh. But you may not know that I'm a big fan of meals where you can sample many different flavors. Maybe that's why I love the above plate of pickled vegetables, feta cheese and olives from Carousel in Hollywood, which comes out at the beginning of every meal. Don't be fooled by the Thai Town address. This spot is Middle Eastern all the way with Moussaka that tastes like awesome eggplant parmesan and Lula Kabobs that are as flavorful as any I've had. The nicer version of this restaurant is supposedly in Glendale, but I've only ever been to slightly divey Hollywood annex. And I feel like too much polish might actually ruin the experience for me. Maybe I'm afraid of change. It's true, I'm scared. And only feta cheese will save me.